In Indian myth, Kangi Ten means a tribal chief. 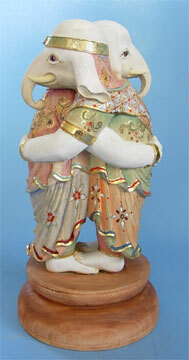 He has been represented as a child of Daijizai Ten and brother of Ida Ten since his adoption into Buddhist mythology. He is generally called Shou Ten and is worshipped as giving power to achieve all goodness, eliminating disaster and giving wealth. A lot of ordinary people believe in him, especially those involved in businesses related with food and drink such as restaurants, bars etc.. Sometimes Kangi Ten is depicted as two bodies with elephant heads; sometimes a single body with an elephant head and sometimes as a couple where the husband has an elephant head and the wife a wild boar's.